Last week, Pinterest released a couple of new discovery options, the biggest one being their new Pinterest Lens which enables you to take a picture of real world objects and find relevant pin matches. But along with Pinterest Lens, they also announced an option called 'Shop the Look' which could end up providing significant opportunity for brands to showcase their wares and connect with interested buyers. As you can see from the above GIF, 'Shop the Look' Pins will have dots attached to specific items within a Pin, enabling users to click on each element to find related buyable Pins so they can purchase that item straight away. It's a handy feature - and one which looks a little like Instagram's coming 'Shopping Tags'. But the difference here is that Pinterest isn't making this an advertising option - the matches you're shown are not brand specific. Or at least, they're not yet. In a post on the Pinterest Engineering blog, software engineer Wonjun Jeong explains how the 'Shop the Look' system works, and how it surfaces relevant related recommendations. Jeong notes that the system uses a combination of both machine learning and human curation to identify matches. "Given a fashion Pin, we use object detection to infer areas of the image that contain products and apply our visual search technology to quickly find and parse through millions of products in order to generate a set of candidate products. Human curators with fashion expertise confirm the most relevant products within the candidate, and we then recommend these products in Shop the Look." 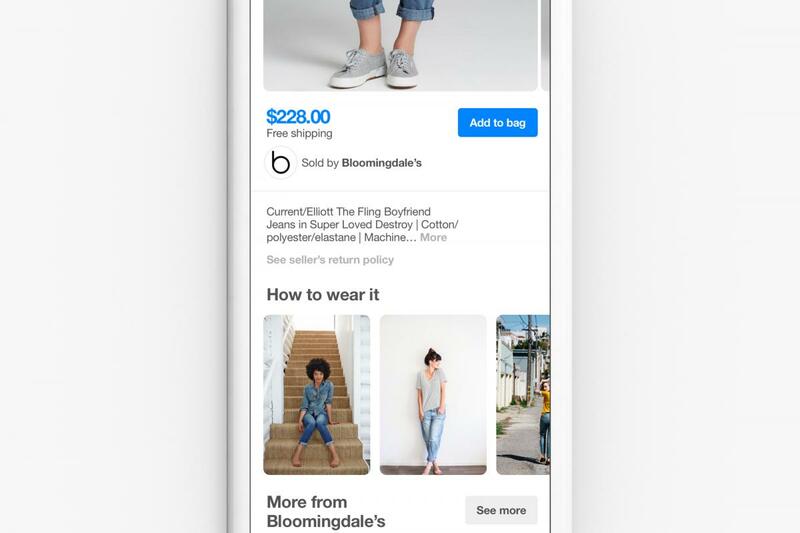 So immediately the offering takes a different approach to how Instagram is looking to implement Shopping Tags, where the matches to each tag are linked to a specific retailer, essentially making it an ad option. But the opportunity for Pinterest to make this into an advertising tool are significant - with more than two billion searches being conducted on Pinterest every month (the vast majority of which are not brand-specific), there's opportunity for Pinterest to give businesses the chance to show up as the top search result in Shop the Look pins, which could significantly boost exposure among users with high purchase intent. As such, it wouldn't be surprising to see this become an option within Pinterest's search ads in future, but at this stage that doesn't appear to be the case. Jeong also explains how they've built Shop the Look using a graph-based match model, which also enables them to provide 'How to Wear it' matches, another potential marketing opportunity. Jeong also notes that the graph-based model also enables them to correlate trending relationships between certain products. "In the future, we'll be able to infer products that are similar or complementary. This means we can recommend looks composed of items that go well together." Their early test results with Shop the Look have been positive - Jeong notes that Pinners are engaging with Shop the Look Pins 3-4x more than regular Pins and saving Shop the Look Pins 5x more. They also go on to visit a brand's website at double, even triple, the normal rate. The announcement of Shop the Look got less coverage than the more interesting Pinterest Lens, but the opportunities of the option are significant. It's worth paying attention to how they're rolled out and what sort of recommendation options the system provides - and how you can ensure your products show up in related recommendations (we'll look to provide insights on this as they come up). In future, Jeong says they're aiming to unify Shop the Look with their other visual search initiatives, which should enable significant expansion of the offering, while they're also working to "bring more content networks and brands onto the platform to help Pinners discover more products they don't even need to know the names of to find and buy". The second point could indicate that Pinterest will be looking to partner with brands, offering ways to increase their exposure through the tool. Shop the Look is now available to Pinners in the U.S.